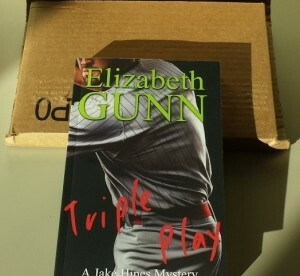 The first proof copy of the Elizabeth Gunn’s re-issued Triple Play paperback arrived in the mail earlier this week. As readers of this blog may have noticed before, I’m rather proud of my Mom-the-novelist, Elizabeth Gunn. To date she has not ‘broken out’ and become a big name the way other regional mystery authors, such as Tony Hillerman and Archer Mayer or Wyoming’s own CJ Box and Craig Johnson, have done. But she has had 13 novels, in two different mystery series, ‘traditionally published’ in the last 17 years. Her publishers have always been conservative with their print runs but we’re pretty sure they sold every copy of her books ever printed. And that’s are remarkably achievement by any standard.